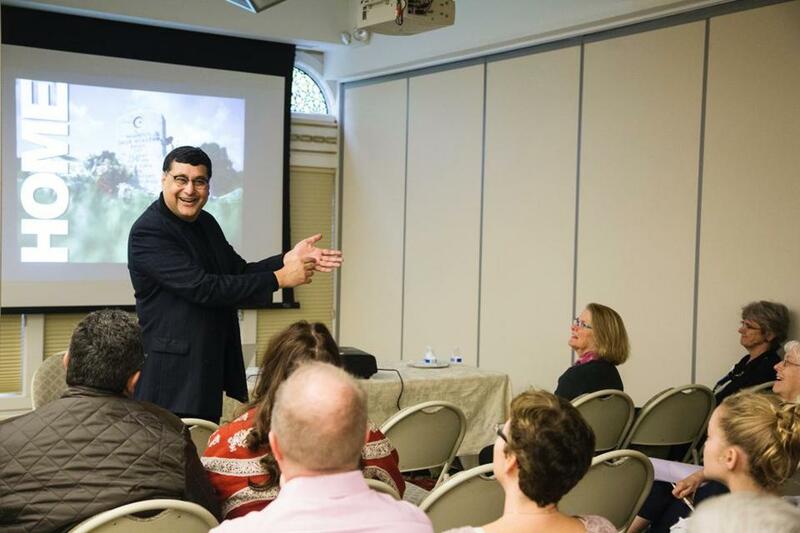 Adil Najam, dean of the Frederick S. Pardee School of Global Studies at Boston University, gave a presentation at the “Meet Your Muslim Neighbors” event about being a Muslim in America. WAYLAND — On a rainy Saturday morning at the Islamic Center of Boston, Shaheen Akhtar spoke to strangers about the Koran — the three on the table next to her, but also about how Thomas Jefferson and John Adams had owned copies. “People think that Muslims have just come here to this country,” but an inclusive dialogue about Islam goes back to the founding fathers, including Jefferson, who advocated for the rights of practitioners of the faith, said Akhtar, an interfaith liaison who works with the center. As part of the fourth annual “Meet Your Muslim Neighbors” event, the Islamic Center of Boston saw a steady stream of Muslims and non-Muslims coming together to learn about Islam. Ann Gibson said that when her two children seemed to be losing enthusiasm for Sunday school at their Lutheran church, she embarked on a yearlong project to expose them to other religions. They visited other churches, a synagogue, and the Islamic Center, she said. “I don’t feel like the secular world is all there is to life,” said Gibson, a visitor and member of the Islamic Center’s interfaith book club led by Akhtar. Robert O’Hearne, a Catholic who first began coming to the Islamic Center for Arabic classes, also brings his two children to interfaith events there. It wasn’t until he started visiting the Islamic Center that he realized how many Muslims he already knew, including a colleague with whom he had worked for five years, O’Hearne said. “Part of it is getting to know people,” he said. The Islamic Center, which offers congregational prayers and a Muslim Sunday school, has long prided itself on its interfaith services, including resources for homeless families through the Family Promise Metrowest organization. “I had to stop [the journalist] and say, ‘Maybe someday I’ll be an expert on love,’ ” he said, smiling as the audience laughed. Around 30 percent of the slaves brought over to the United States were Muslim, according to Najam, who said Muslims are part of American society across the nation and are strongly represented in medicine, science, and law. During a question-and-answer panel, attendees spoke about how the media contributes to an Islamophobic narrative by disproportionately linking Muslims with violence, with little interest in showcasing the larger, peaceful Muslim community. Some likened it to framing coverage of Christians through the lens of the Westboro Baptist Church and the Ku Klux Klan. “Our moderate voices need to be heard,” Akhtar said. Muslims at the center spoke of how recent events — both terrorism and recent political discourse — require them to have very difficult conversations with their children. “How do you explain to your child that someone who has a name like his, someone who claims to be from the religion that he has grown up in, would do a horrible thing?” Najam asked. But Najam, as well as attendees of other faiths, emphasized that non-Muslim parents need to have the difficult conversation about how to deal with Islamophobia, too. Many of the Muslims at the event spoke optimistically about the future. He spoke about how the Westboro Baptist Church, a group from Kansas known for their vitriolic protests against gay rights, veterans, media, and many other ideas and groups, had come to protest the Islamic Center of Boston on a cold Friday morning. The next morning, Khan said, he learned a group of high school students had vastly outnumbered the Westboro Baptist Church with their own peaceful counterprotest — and not one of the students participating was Muslim. “There are a lot of dark clouds, but this is the silver lining,” Khan said.